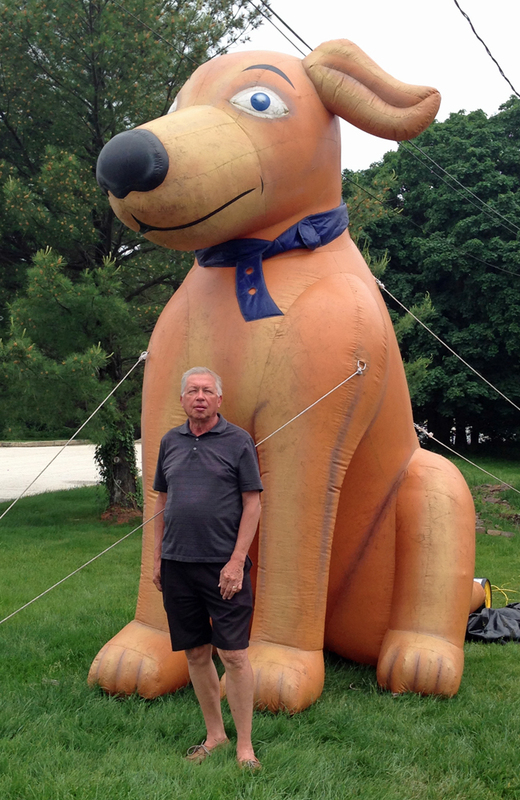 Inflatables – The Home of My "Big Things"
Next to the Big Valvoline Guy was another inflatable – this dog. This made it a two-fer! When we were getting this image a nice young man working at the Valvoline Instant Oil Change business came out and offered to take our photo together. I appreciated the offer. 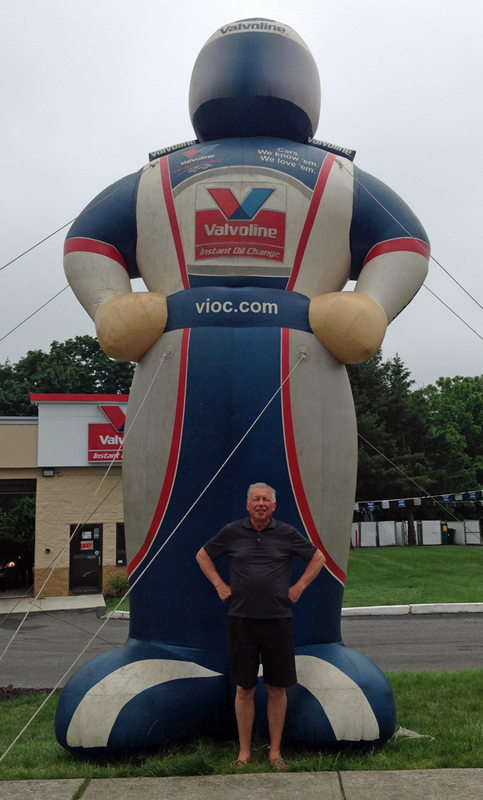 While on our way to the Greek Festival at St. Sophia Church in Norristown we were driving on Ridge Pike and spotted this Big Valvoline Guy. I whipped into the parking lot to grab this image. I always like to get these unplanned shots! 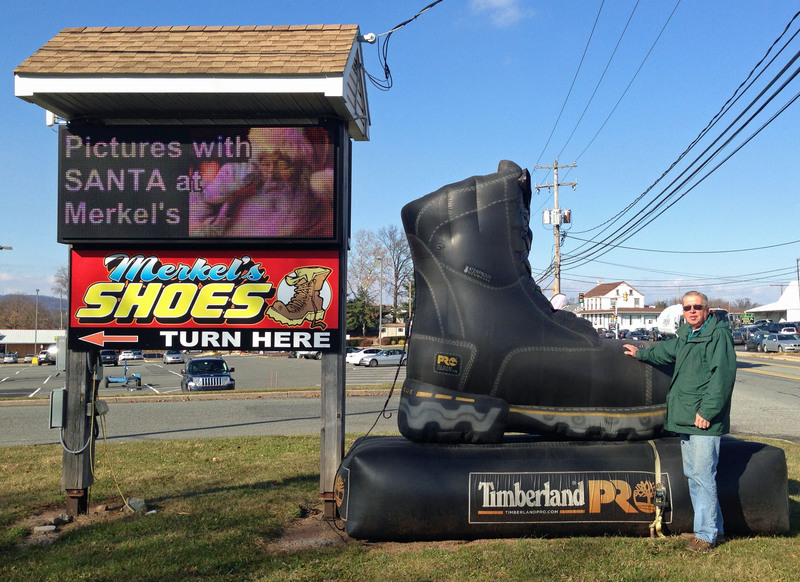 On our way to Boyertown, PA to visit a gift shop for a little Christmas shopping and we spotted this Big Boot. 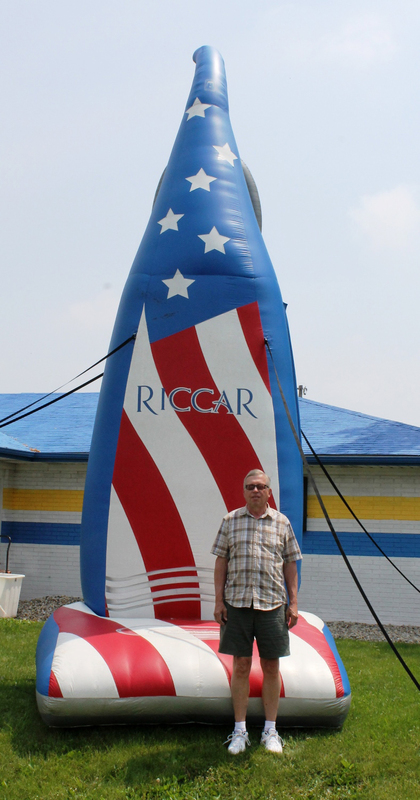 I thought it was a permanent Big Boot but as we got closer it turned out to be an inflatable. 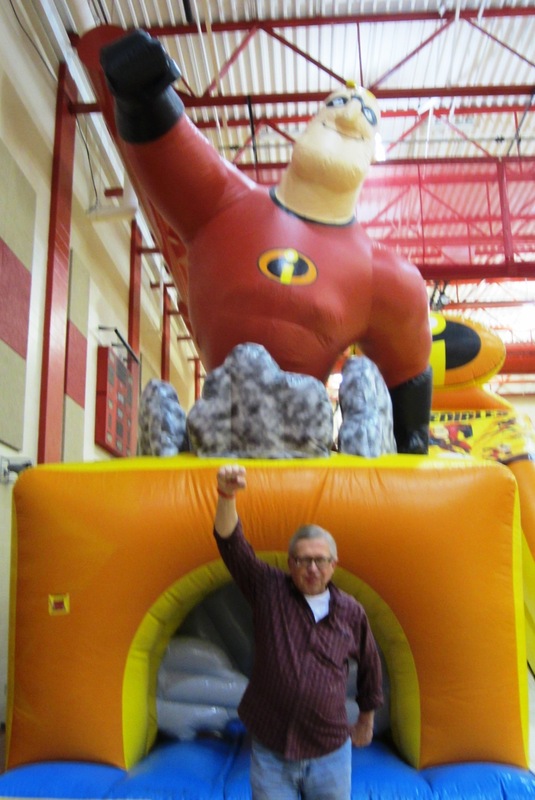 A little disappointed but it was one of the better inflatables I’ve seen. We didn’t stop to see Santa but we did discover the Jukebox Restaurant in Boyertown. 7 kinds of soup (I had Crab Bisque,) great place, we need to go back. On our way to look for a little pine tree for the front of the house we stopped by Bustards Christmas Trees close to home to see what they have to offer. Since we are fairly new in the area we had not shopped at Bustards before. After pulling in I saw this inflatable that I know I had to get. Bustards is a very friendly place and their motto “Real Trees make Scents” appeals to me. 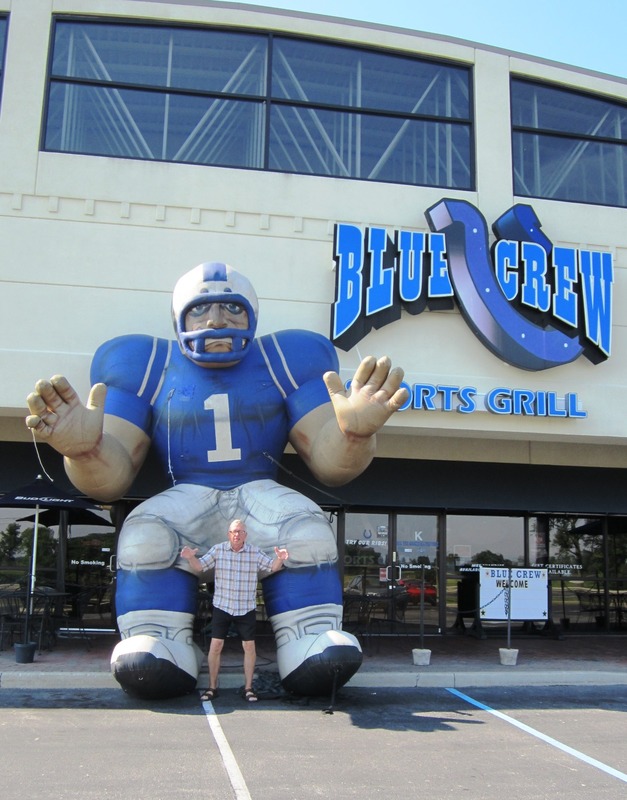 We were looking for a place to eat and ran across a shopping center in Middletown, DE that looked like it would have a restaurant or two so we pulled in. 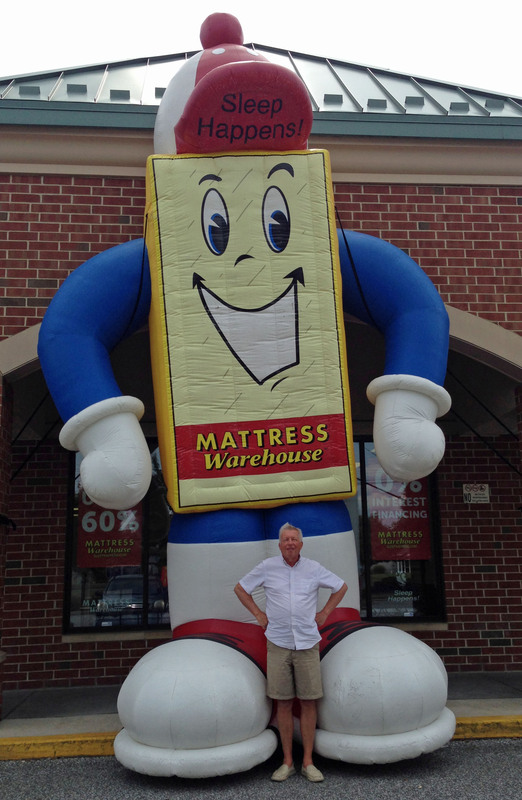 While driving through the center we spotted this inflatable mattress. However, we didn’t find a place to eat. 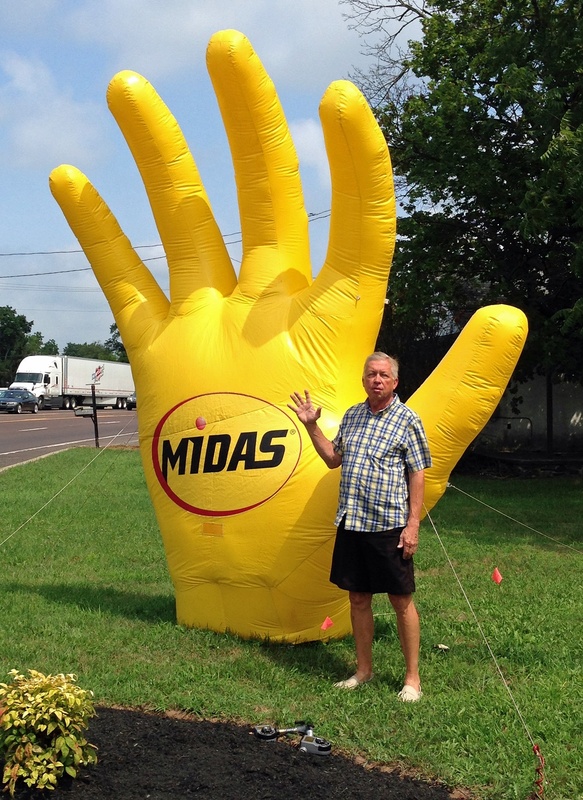 We were out and about traveling down Bethlehem Pike when we spotted this Big Midas Hand. 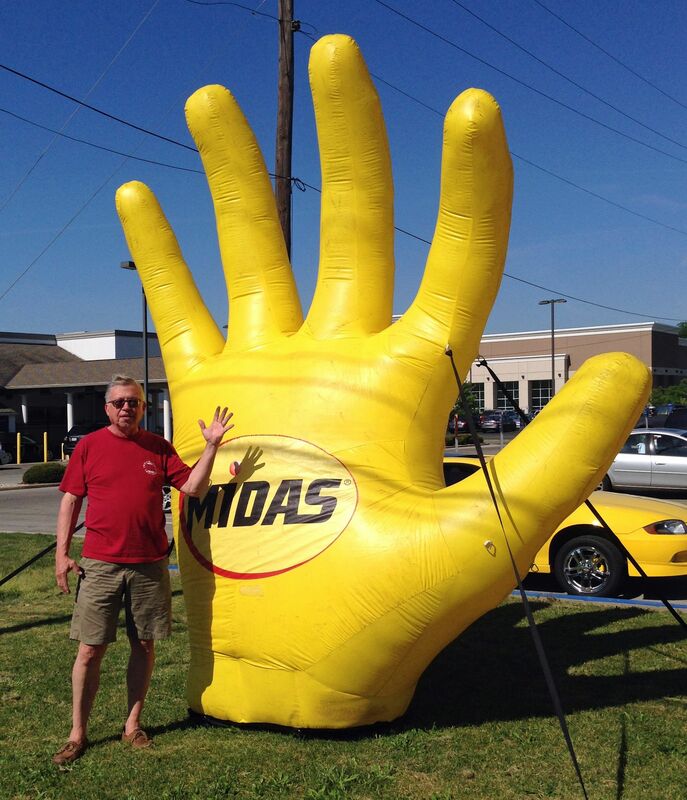 I wonder how many there are of these inflatable hands since I already have one from the Midas store on Keystone Avenue in Indianapolis. 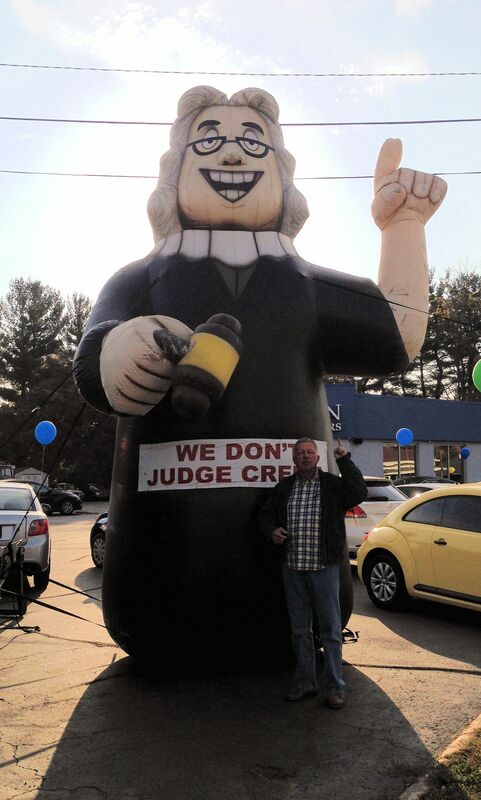 On our way to Saugatuck, Michigan we were surprised to spot this inflatable Big Judge. I’ve taken photos with a lot of Big People, pirates, Amish people, etc. but never found a judge before. This one illustrated Mike Anderson’s Auto Group pledge to not judge your credit when purchasing one of their cars. 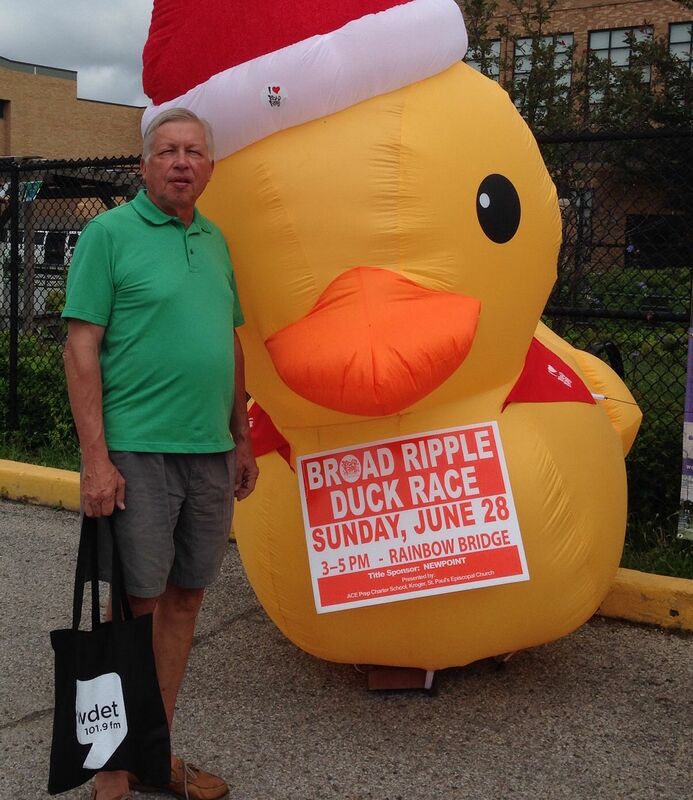 Ran across this Big Rubber Duck at the Broad Ripple Farmer’s Market advertising the Rubber Duck race in the canal. This is the same canal the Colt’s Pro-Bowl punter, Pat McAfee jumped into late one night a few years ago. Caused quite a stir at the time. Here’s an inflatable I spotted in front of the Midas shop in Glendale on my way downtown. I had to get with the Chief Photographer and get back to get the image. 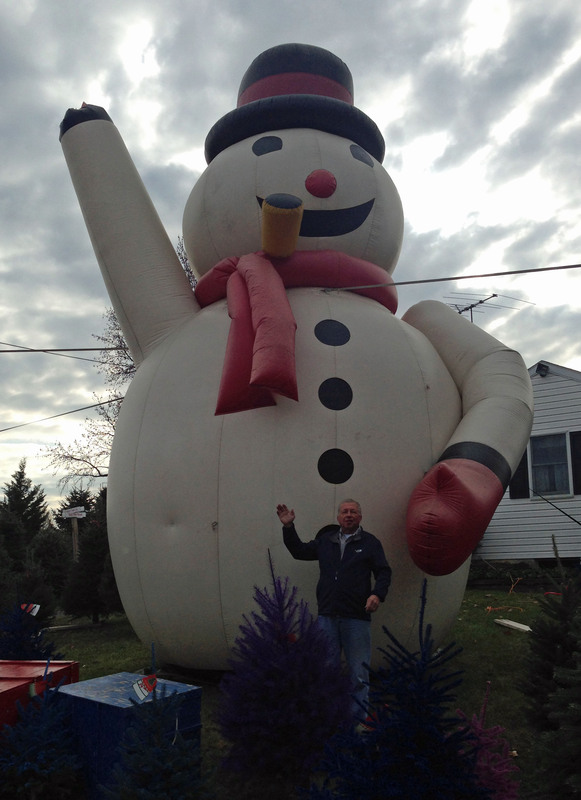 I’m not big on inflatables but I haven’t seen this one before. The 4th of July Festival in Carmel is a lot of fun and offers entertainment throughout the day following the end of the parade. There are multiple performance stages, food booths and vendor and information booths. 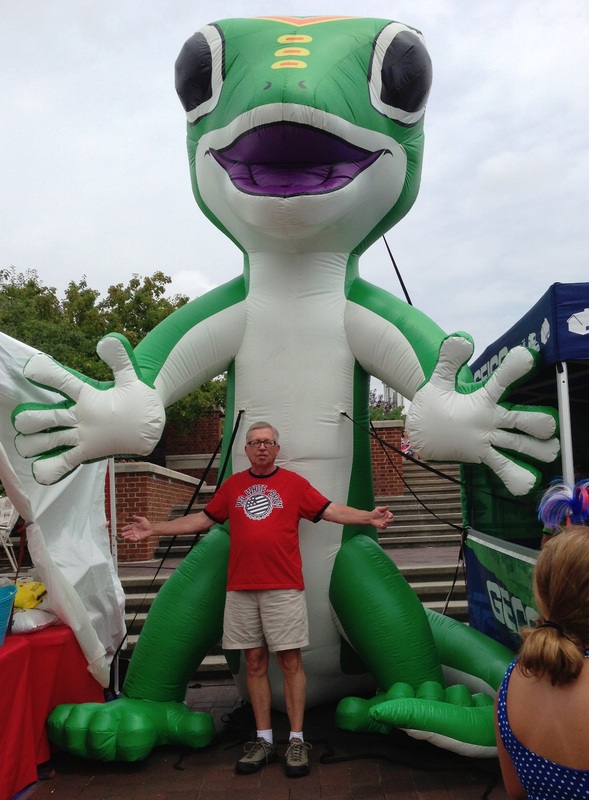 This Big Gecko was outside the GEICO booth so naturally I had to grab a shot. Notice the Red, White and Brew T-shirt. 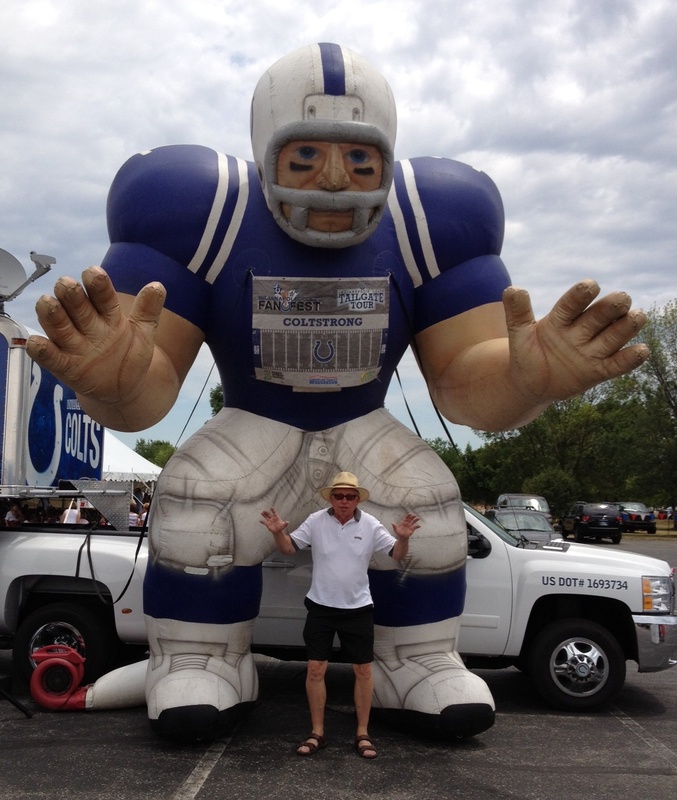 Living in Indianapolis, mind it becomes almost obligatory to have Colt inflatables at most events. The one on the left was also at the Freedom Festival in Fishers. 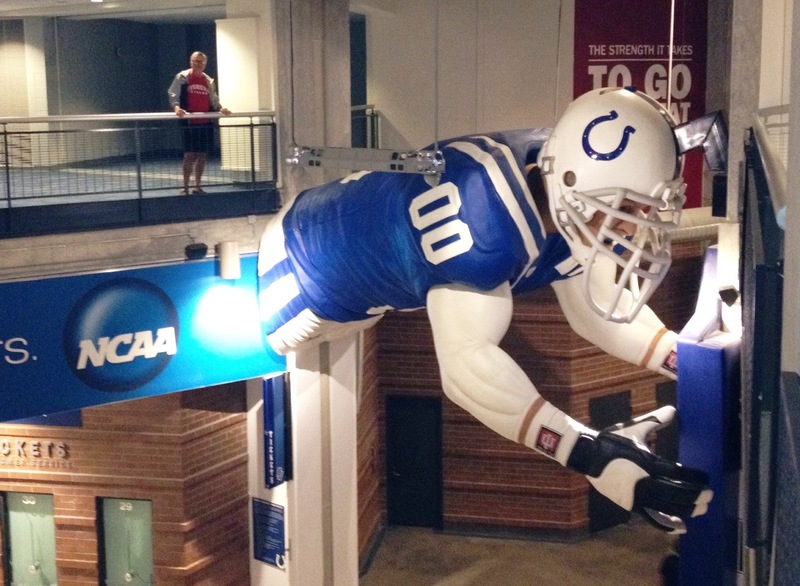 Later that year Fishers Football was playing at Lucas Oil Field (“The Luke”) and our way out of the suite this Big Colt was hanging around. Outside the T&H Sweeper Company branch on Indiana SR-9 in Anderson I spotted this Big Vacuum. We were on our way to Mounds State Park. Indiana has some very nice state parks and we have started to visit them. Mounds web site describes it best stating it “features 10 unique “earthworks” built by a group of prehistoric Indians known as the Adena-Hopewell people. The largest earthwork, the “Great Mound”, is believed to have been constructed around 160 B.C. Archaeological surveys seem to indicate it was used as a gathering place for religious ceremonies.” We enjoyed our time in the park, it’s nice that it is so close to home. We drive Keystone Avenue often, both on the way south into Indianapolis, as well as north to the Carmel business district. 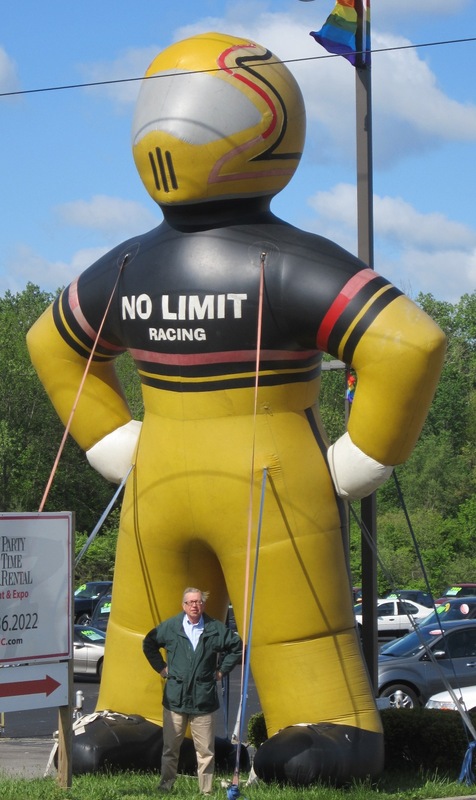 We were driving down Keystone on our way to downtown Indy and spotted this big inflatable race car driver out in front of a used car dealership across from the WalMart. We didn’t have time to stop then and hoped it would still be there in the next couple of days. Sunday morning we drove past and stopped to get this image. There were a couple tire kickers in the lot wondering what was going on. Deb teaches at Fishers High School in Fishers, Indiana. They were holding their Dance-a-thon to benefit Riley Hospital for Children in Indianapolis. Chris Edwards, who teaches with Deb was instrumental in getting Riley named as the beneficiary of the fundraiser. Last year, his son Ben was diagnosed with cancer and it was through the efforts of the Riley staff that Ben is now a cancer-free, happy, 3 year old and celebrating his health with big brother Blake. 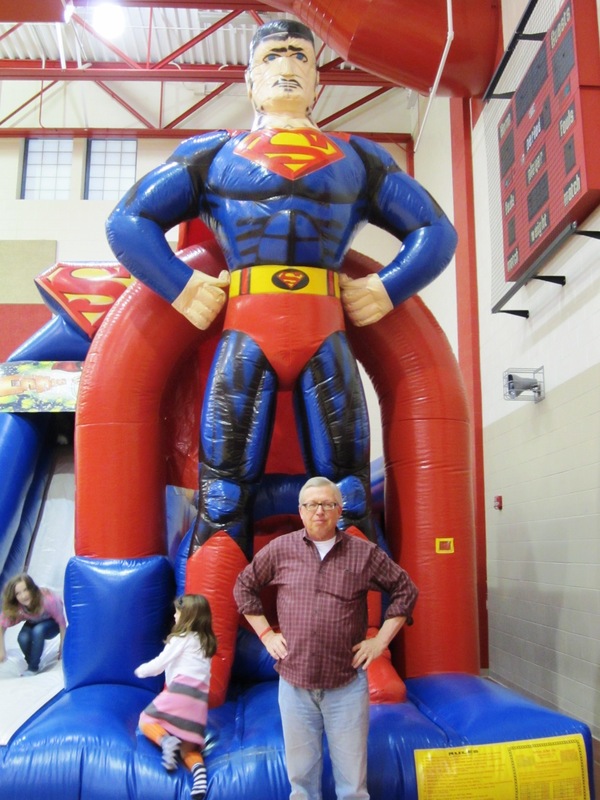 Anyway, at the dance-a-thon there were many activities, including these two big blowup slides. Latitude 39 is a new Family Entertainment Center that recently opened near our house. It bills itself as a Premier Entertainment Center. They offer 70,000 sq. ft. of entertainment: a sports theater, luxury bowling, game room, lots of TV and dining. Sounds like an exciting place. 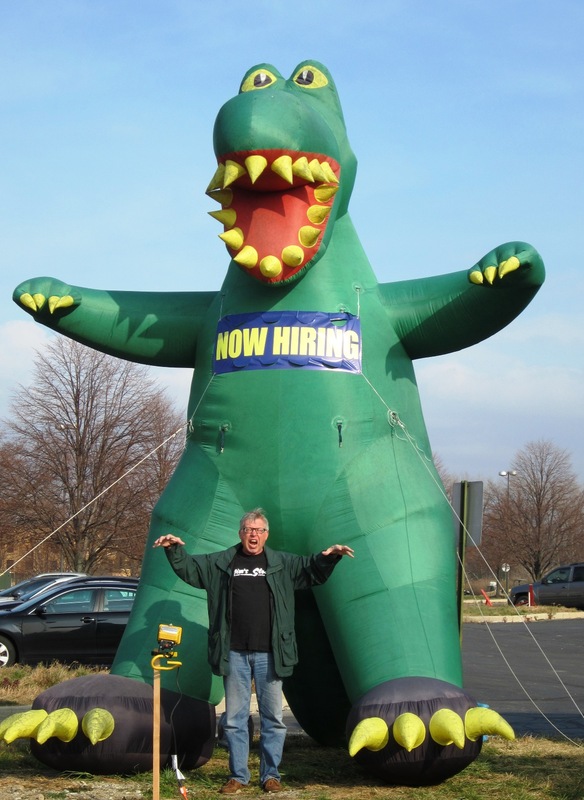 Prior to opening they were looking for new hires to satisfy all their guests and used this inflatable dragon to catch their eye. The Chief Photographer spotted this guy and we were able to grab this image. We were at the Freedom Festival event in Fishers, Indiana and ran across Master Yoo’s booth. 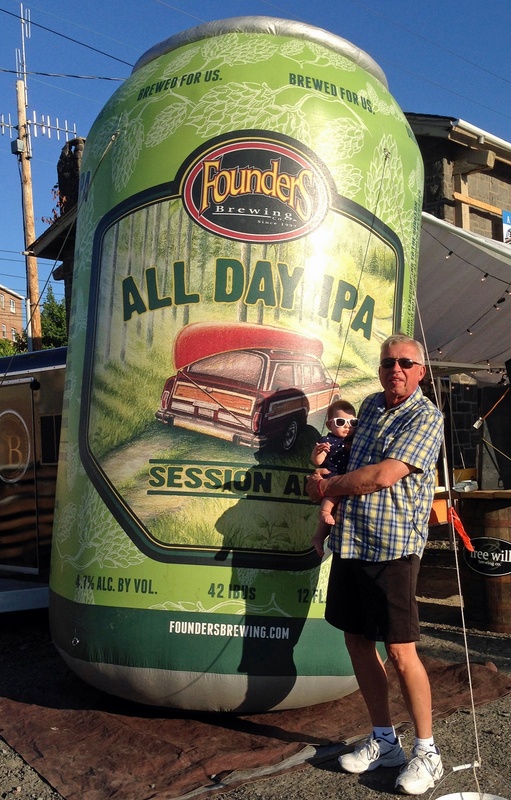 This Big Inflatable caught my eye. 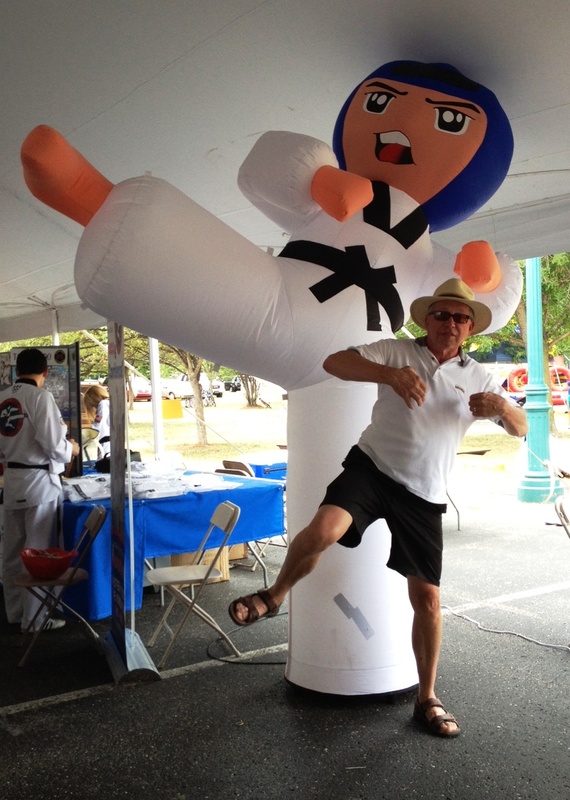 I tried my best but I don’t think I have a future in Tae Kwon Do. I would like to get one of these costumes/robes or whatever you call it. In Grinnell, Iowa we visited the Merchant National Bank on Main Street. This bank was designed by Louis Sullivan, a prominent mid-West architect and mentor to Frank Lloyd Wright and often called “The Father of the Skyscraper.” He designed many famous buildings from Chicago skyscrapers to many mid-West banks. This bank is a very good place to visit, they have a docent in place. 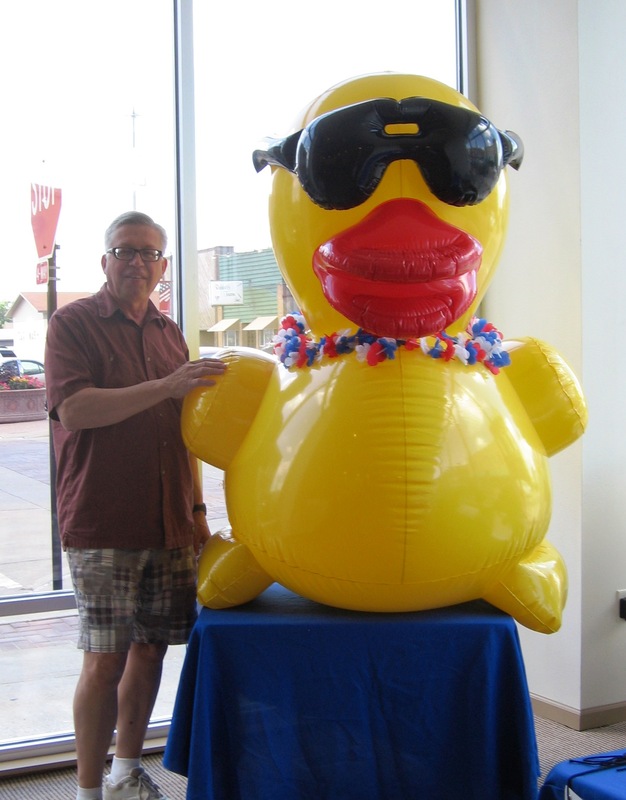 At any rate, enough history, this duck was used to promote the Duck Daze and Derby fundraiser to support youth in Powershiek County. I bought a duck and entered but haven’t heard if I won. 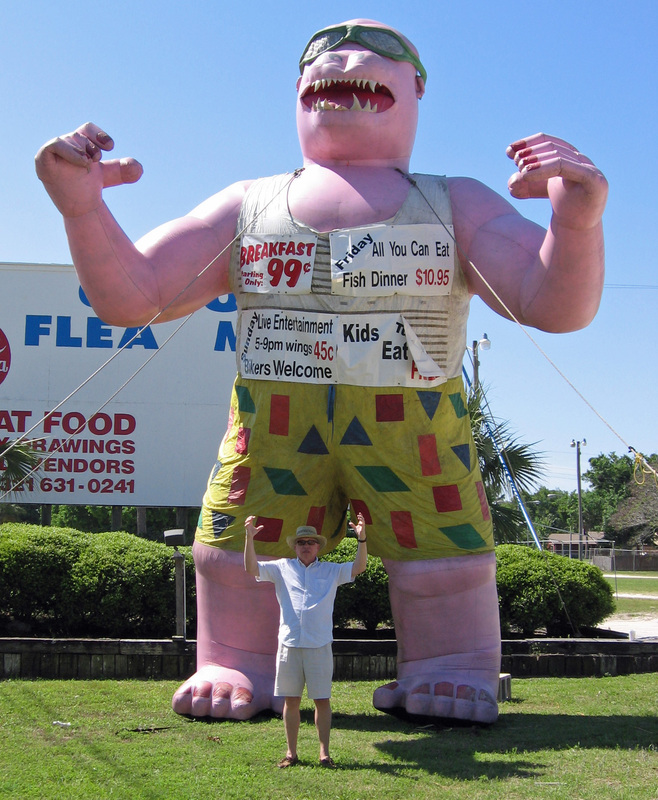 Next to the Cocoa Flea Market in Port St. John, Florida is this Monster advertising Redfish Charlie’s Bayou Grill and Tiki Bar. Looked to be a pretty laid back bar. With a slogan like “It’s OK by Me, If it’s OK Bayou” who could not have a good time. Especially if you ride a motorcycle. They have a big BIKERS WELCOME sign as well. I didn’t have my colors with me or I might have stopped in.